The Diocese of Savannah was formed in 1850, comprising the entire state of Georgia and a large part of Florida. The Cathedral of St. John the Baptist, dedicated in 1876, is the seat of the diocese. 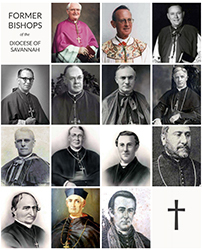 The Diocese of Savannah has had 14 bishops since its founding in 1850. Of our 120 priests, 88 are serving actively and 27 are in retirement. There are 55 parishes and 24 missions and mission stations. We have 73 religious sisters and 5 brothers in the Diocese, as well as 22 religious priests.